Two camps, two sets of dedicated supporters. “I am 100% for Governor Mapp,” Clifford Joseph, Director with the Virgin Islands Fire Service said. “We have a dynamic candidate in Albert Bryan and Tregenza Roach,” Carl Knight, Chief Policy Strategist with the Bryan/Roach Campaign said. So just how did these two teams, find their way to the top of the pack? “It’s all about the ground game,” Knight added. Knight is the chief policy strategist with the Bryan and Roach campaign. He believes it was the grassroots approach to canvassing to got his team into the top two. That strategy proved to work. As Bryan / Roach rose to the top from a list of 6 other candidates, with the help from an energized base and eager younger voters. Donna Christian- Christensen, who led her own race against Mapp in the previous election, said the Bryan Roach team is touching on something she didn’t, but said both finalists have a tough competition ahead. Now Bryan / Roach face the incumbent Governor and Lt. Governor, who hope their record and leadership in the aftermath of Hurricanes Irma and Maria will give them another four years in Government House. “I think Governor Mapp has demonstrated his governance is what we need to get us out of the trenches that we are working our way out of and then continue doing what we’re doing right now,” Joseph added. 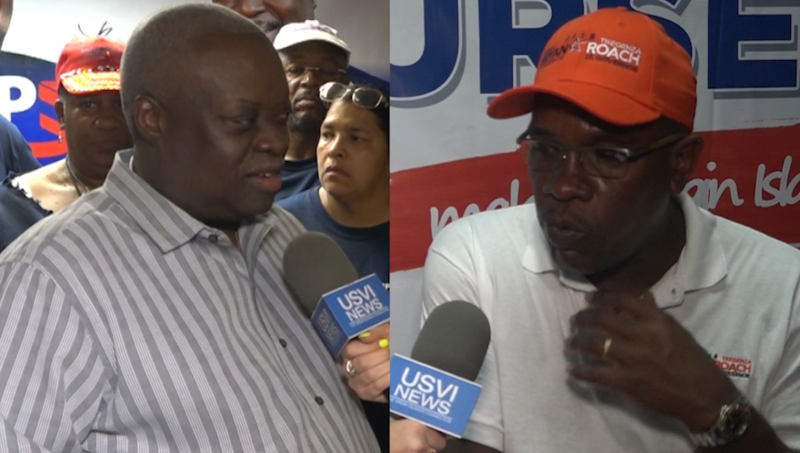 Mapp and Potter have been taking the approach of showing what they’ve accomplished in the past four years to get their base out to the polls November 20th. They’re using the message of continuing on the same path to recovery, or face starting over with a new administration. Frankie Johnson, Governor Mapps’ senior policy advisor said he can almost guarantee victory for his candidate. The campaigns now get back to work as they face another tough race November 20th.